After reading a post on Grassroots Motorsports about a person traveling to my area to pick up a 1998 M3 as a new toy, I browsed Craigslist and found a couple of others for sale (and the one that I now know is sold). 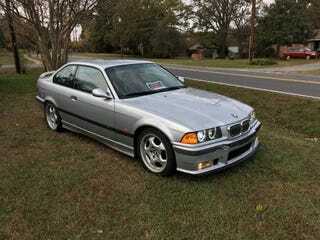 Kinda want a beat E36 M3 right now. But I know that these are touchy for maintenance, and it weighs about as much as my 2016 GTI, with similar 0-60 performance, but with surely better handling feel, rear-wheel drive, and as a toy I would get it with a manual. This “want” will probably pass. Hmm, maybe I should look for a Z3 M Coupe again . . .